The world produces enough food for everyone, yet hunger kills more than 200 children every hour. Now a coalition of charities has banded together and is spearheading a campaign to address underlying causes of hunger, with an unprecendented social media side that we can all take part in to make a difference. This year the UK has the presidency of the G8. 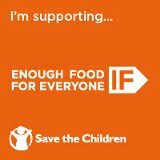 We need to make enough noise so that David Cameron will be compelled to use his position to take a lead on hunger. The PM has called a “special event” on hunger the day before the G8 – this is our opportunity. IF we give the poorest people the power to feed themselfs. IF we stop corporate tax dodging. IF we use land for food, not fuel. IF we force global corporations to play fair. In this day and age no one should be without food, we have to generate as much noise as we possibly can so that our leaders have no choice but to act.